Luxury accommodation, 4 bedrooms, 3 bathrooms, sleeps 10. 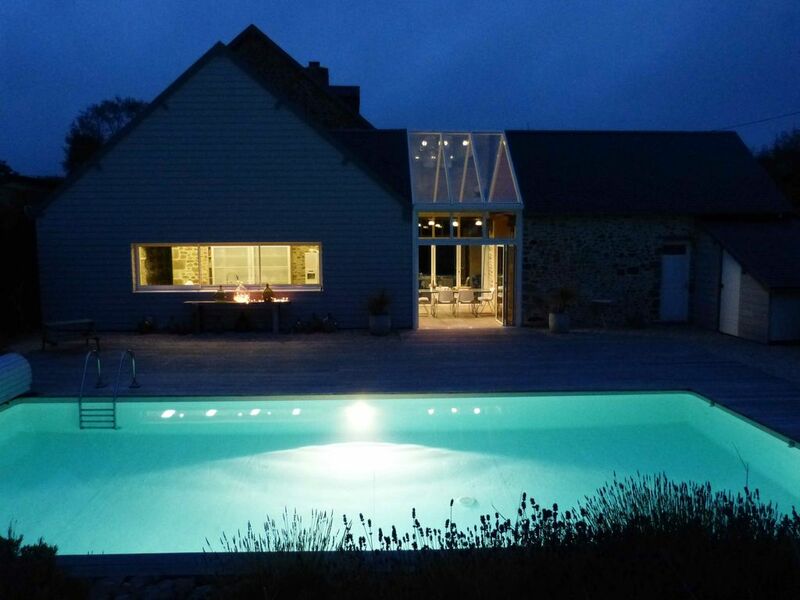 Just outside the pretty coastal village of GOUVILLE SUR MER, 'La Brocanterie' is a beautifully restored stone-built house, open & light with all modern comforts. Decorated in 'clean rustic' style with brocante objects and furniture, the house has lovely rooms in which to relax and entertain with ample space for 2 families / 10 people. The large sunny sitting room (TV, dvd) is ultra comfy with 4 sofas, big chairs with a log burner for chilly winter evenings. Next door is the dining room with long table and benches by the fireplace. The huge kitchen, which cleverly overlooks the pool, is fully equipped for the most enthusiastic cooks. Under the glass conservatory roof is the family dining area. The kitchen-conservatory glass doors fold back for great inside-outside flow to the deck and lovely heated pool. The gamesroom has lots of toys & games. WIFI provided. We have a travel cot, highchair, pushchair, potty, changing mat. The 4 bedrooms / 3 bathrooms are spread over 3 floors. 1 bedroom en-suite on the g/fl. One double suite on first floor. Two bedrooms on 2nd floor with 3 singles in each. The flat sandy beach is about 5 minutes' drive. It's a bike ride or short drive to the village for bakeries, supermarket & weekly market. We have a 2nd beautiful gîte very close by. GOUVILLE SUR MER BEACH & VILLAGE: Gouville sur Mer beach is about a five minute drive from the house (some rental properties are not as close to beaches as they claim). Good restaurant and quiet French bar on beach front. Gouville beach is clean, sandy and uncrowded. In summer activities include sand yachting and kite surfing and free daily keep fit classes on the beach. The thriving village of Gouville sur Mer has a twice weekly market in summer, supermarket, 2 bakeries, butcher, banks, hairdressers, beauty treatments, pharmacy, doctors, bar, post office, churches, an exhibition centre and a tourist office. There are 2 restaurants and many more within 10 minutes drive including 'Le Mascaret', a restaurant gastronomique and 'La Cale' , a seafood restaurant on the beach with distant views of the oyster and mussel beds. This region offers a spectacular coastline with picturesque stone villages, little ports and beautiful, sandy beaches. FAMILY ACTIVITIES: Within 15 mins - horse riding on beach or forest, sailing, sand yachting, kite surfing, bike hire, farm visits, summer musical events, horse trotting-racing, archery (lessons), yoga on the beach, petanque, golf, skim boarding(lessons), visits to the oyster/mussel beds in horse drawn carriage, fishing-on-foot, markets, fun fair in August, cinema. For 18+; casino, night club. 20 minutes or more - carting, 2 forest adventure parks (walkways in trees), bowling, carting on ice, ice skating, rock climbing. Further inland is the Parc Régional des Marais du Cotentin, a fascinating regional park with a rich bird life, as well as houses made of clay and straw. To explore on foot or by boat. Further afield - aquarium and reptilarium near Mont Saint Michel, Cite de la Mer at Cherbourg, Aquarium and museum at Granville, Festyland attraction park, mini golf, 2 zoos, visits to cheese factories, museums and more. NORMANDY HIGHLIGHTS: We are well placed for cultural outings with sights all around us. Chateau de Pirou (15 mins), Chateau de Gratot (20 mins), Jardins d'Argences (20 mins), Abbaye Cérisy-la-Fôret, (50 mins east), The town of Bayeux and its Tapestry (1hr north-east), spectacular Mont St Michel ( 1hr 15 south) . The top 10 D-Day Beaches : Utah Beach & Sainte-Mère-Eglise (50 mins north) , La Pointe du Hoc, Omaha Beach, American Cemetry, Batteries de Longues, Arromanches, Gold Beach, Juno Beach, Sword Beach, Pegasus Bridge. Drivers can follow themed and signposted routes. Museum info, more leaflets and booklets in our House Book. Brittany is south of us and worth a day's exploration of old Dinard, Dinan and the picturesque walled town of Saint Malo. There is one toilet downstairs. On request only. Please ask before your arrival. Under floor heating downstairs, electric heaters in bedrooms upstairs. The heating is not included in the rates. Electric oven, gas & electric hob, microwave, popcorn maker, raclette machine, oyster glove and various seafood tools. There are 2 areas for dining; the kitchen-conservatory and the dining hall. We have many golf courses around us. The pool is in use from mid May to the end of September. It is heated by an air pump during the day, weather permitting. We have a motorised pool cover in place for young children. THE POOL : IN USE FROM MAY TO END OF SEPTEMBER . It is possible to make arrangements to use the pool during low season - please contact us for more information. The pool is 10m by 4.5 m and 1m 40 deep throughout. The wooden decking area is about 80m² and surrounds the pool on 3 sides. There is a motorized pool cover specifically put in place to protect children under 5. The pool and deck can be completely closed off by closing and locking the doors from the kitchen. The doors opposite which open onto the courtyard do not lead to the pool. We have a few pool rules which are for your safety. There is no diving board. The summer temp of pool is about 28 ºC. In the cooler months it will not be as high. There is no garden at this property. We welcome children of all ages - do ask questions regarding safety in the house, courtyard and pool area especially if you have very young children. We are sorry but dogs are not permitted at this property. Our family of six stayed at La Brocanterie over the New Year's holiday. After a long day of driving, it was unbelievably wonderful to arrive at the house and find owner Debbie there with the house all lit up, a fire in the cosy wood stove, music playing, essential grocery items stocked, and a very nice basket of Normandy goodies. What a welcome! We especially enjoyed the common areas in this home-- the layout of the living spaces is such that you can have great family time, but still not feel like you are all on top of each other. My younger kids enjoyed the game room, while the rest of us spent a good bit of time reading and relaxing in the beautifully furnished and superbly comfortable lounge. We prepared several meals in the house and found everything we needed in the well-equipped kitchen (huge bonus points for the Nespresso machine!). The local area was charming. We frequented the local boulangerie, and had several great meals out-- including New Year's lunch at a Michelin-starred restaurant minutes away from the house. I can only imagine how lovely the beach and, indeed, the house itself with its outdoor spaces and swimming pool, must be in summer. We hope to return to find out! Thank you so much for the lovely review! We do hope we will have the pleasure of welcoming you back one day for a summer holiday. On seeing the photos for the property on the owners' website we thought the house and pool looked amazing. It was every bit as good as it looked. The house is well equipped with everything that you would need from days at the beach, to keeping children entertained, to cooking and baking in the impressive kitchen. The owners are very welcoming, knowledgeable about the local area, and easy to contact if needed. The house and pool were clean, well maintained, excellently furnished and a joy to visit. We visited at the tail end of the Summer season, so not all local restaurants and attractions were open every day, but Debbie kindly advised us on what would be open and when and which local markets were running. We spent the majority of our time locally at the seaside towns and villages within a short drive are all beautiful and have fantastic sandy beaches. We did drive for a little under an hour to Omaha beach for D day museums and Bayeux, which was great for a day out. We would definitely recommend this property to friends and relatives and hope to return to La Brocanterie sometime in the near future. We have stayed at a few holiday rentals in France and this is the best by far. La Brocanterie is a wonderful home for anyone looking to explore Brittany and Normandy. The location is perfectly situated between the two - just an hour to the DDay beaches and an hour to Mt St Michel. The town of Gouville-sur-Mer is delightful and has a good selection of places to eat and shop. The house if beautifully appointed an exceed our expectations from the description. Clean, well maintained and had all the things we needed. Most of all, the owners were always available and responded immediately to any of our needs. I also have to say that we ate the best oysters of our entire lives while there. Highly recommended. House is wonderful. Two bedrooms have connected baths and are great for adult couples. Two bedrooms on top floor are smaller and require maneuvering up and down somewhat narrow stairs - but great for kids. Big, well supplied kitchen - this and on patio is where we "lived". Very large den would have been great if weather had not been so inviting. Village is fun. And easy drive to many Normandy sights, to beach, etc. Firstly, I would say that the photos of the house do not do it justice. It is far more spacious and luxurious than it looks on the website. The outdoor space is perfect with the pool area (heated pool) and courtyard where we barbequed most evenings. We had three young children in our party and they were very well catered for (playroom full of toys/cot/highchair/stairgate etc)and you will find that all the equipment you need generally is thoughtfully provided. The owners met us briefly on arrival and were v friendly and helpful. The location is peaceful but close enough to the small town with bolangerie etc and beaches. We would recommend Le Cale restaurant for the moules and frites. Highly recommend staying here. This was our first visit to Normandy with our 2 year old son and when we arrived at the property we were met by Debbie who was charming and very helpful. She showed us around La Brocanterie which was even more lovely than in the photographs, a really beautiful property, in a quiet yet convenient position and immaculately presented with everything you could possibly want, along with a great record collection(!) and lots of space to chill out!! The swimming pool was warm and the electric cover was a plus for our toddler. We visited several local restaurants that were recommended which were excellent, but our favourite was La Cale, we loved the food and informality! We were well placed for doing day trips to Granville and Mont St Michel and then returning in time to have a swim. We are definitely planning to visit again in 2013 but hopefully for longer than a week! Thank you Debbie and James. Gouville-sur-mer is situated on the west coast of the Normandy peninsular. About an hour from Cherbourg and 1hr 30 from Caen, it's easy to reach. Well placed for cultural outings such as Mont St Michel, the Normandy Landings, The Bayeux Tapestry and so many activities and sports on offer; golf (see notes on golf), karting, horse riding on the beach, kite surfing and much more. Gouville has a weekly market (twice in July/August) bakeries, butcher, supermarket etc . The beautiful local beach, flat and sandy, is only 5 minutes drive from the house. Agon Coutainville (10 mins) has more restaurants.. Coutances (10 min) has an annual May jazz festival. The pretty port of Granville (40 min. south) offers chic shopping and the Christian Dior museum. Picturesque port Barneville Carteret (40 min. north) has a Michelin rosette restaurant and trips to Jersey. Our part of the coast is a particularly welcoming area of Normandy; child friendly with plenty to see and do for all ages. Golf: There are at least 16 golf courses we could mention in Brittany, Upper and Lower Normandy. Because we are situated in Lower Normandy we are fortunate enough to be within reach of many of these golf courses. Here are 5 that we recommend. You are very welcome to email or phone for more info about these courses, other courses and group discounts. The local club in this area is GOLF DE COUTAINVILLE (12 mins drive) It's a particularly friendly club with good restaurant, golf coaching and regular competitions for all. It's also a few minutes' walk to Coutainville beach , shops & village square. Arrival day is Friday or Saturday. Check-in between 17.00 - 21.30. Check-out by 10.00. All bed linen, bath and pool towels provided. Sorry no animals allowed on the grounds or in the house. No smoking inside the house.